Since the late 1990s investors have been faced with new challenges due to changing locational characteristics in the Central European transition countries. Export demand became the main driving force of manufacturing FDI as opposed to local-market penetration in earlier years. In addition, increasing production costs drove investors to relocate or upgrade their subsidiaries. FDI effects on structural upgrading can be traced by using a combination of various approaches and sources of information: microeconomic, sectoral and macroeconomic. In the microeconomic approach, we rely on findings of case studies showing the close connection between the competence of a subsidiary and its chances for upgrading. At the macro level, changes in the industrial distribution of FDI stocks is analysed. For further industrial characteristics we rely on a database comparing the performance of foreign investment enterprises and domestically owned enterprises. Shifts of capital, labour and investment of foreign investment enterprises support the existence of a 'flying geese' development model. Transnational companies located low and low-medium-tech export-oriented subsidiaries in the low-cost Central European transition countries during the 1990s. Later on they moved the subsidiaries further to the East and rarely upgraded these activities in the more advanced countries. 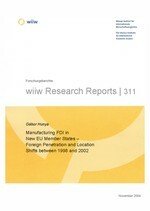 Manufacturing FDI in the new EU member states increasingly concentrated in the most internationalized industries such as the automotive industry and electrical engineering, which provide greater opportunities for upgrading and networking. The new EU member states successfully moved from low-tech to medium-high-tech industries, but their performance in the high-tech sector has been uneven and recently also hindered by the crisis in the electronics industry.